Crafts, role play ideas, sensory bins, recipes, and early science activities packed with spiders! Spider-filled posters, activity sheets, flashcards, crafts, coloring pages, and games woven just for you! 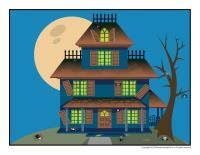 (Open thematic poster-Spiders) Print, laminate, and decorate the walls of your daycare with all kinds of posters. 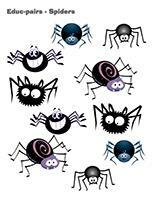 (Open educa-decorate-Spiders) Print, laminate, and cut out the various items. Use them to decorate your daycare and set the mood for the theme. (Open educa-numbers-Spiders) Print and laminate the posters. Display them on a wall to decorate your daycare throughout the theme. 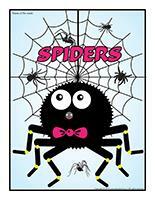 (Open educa-letters-Spiders) Print and laminate the posters. 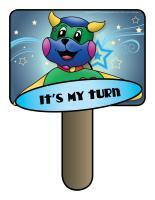 Display them on a wall to decorate your daycare throughout the theme. This special tool was created in response to a special request received. (Open medicine cabinet inventory) Print. List the contents of your medicine cabinet and display it on the door or nearby. (Open Poni discovers and presents-Spiders) Print and laminate. Present the different spider body parts to your group. Use a Poni puppet or another puppet children are familiar with to do so. Have you ever caught a spider? How does a spider capture its prey? How many legs do spiders have? How many legs do other insects such as ladybugs or bees have? Are you afraid of spiders? Are you afraid of other types of insects? Where in nature can we see spiders? Have you ever seen a spider in your house? 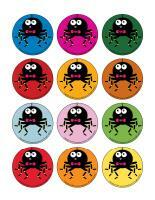 (Open educa circle time-Spiders) Print the questions and the word flashcards. Laminate them. Deposit the questions in a box and encourage children to take turns picking one. Spread the word flashcards out on a table or display them on a wall. Also print the "It's my turn" card. Laminate it and glue a Popsicle stick behind it. It will help children respect the child whose turn it is to speak throughout this activity. The questions will help little ones develop their sense of observation, their vocabulary, and cooperation skills while providing them with the opportunity to practice waiting for their turn. This tool will help you organize a group discussion about the theme. As children arrive in the morning, use a makeup pencil to draw a spider on their cheek. Make a unique spider hat that is sure to attract children's attention in order to introduce your theme. Simply hang plastic spiders all around the rim of an old hat. Let children take turns wearing the hat throughout the theme. 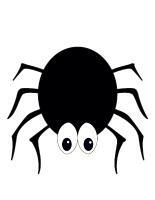 (Open picture game-Spiders) Use the pictures to decorate your daycare or to spark a conversation with your group. Print, laminate, and store the pictures in a Ziploc bag or in your thematic bin. 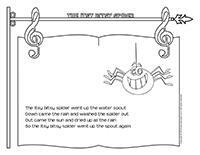 (Open activity sheets-Spiders) Print and follow instructions. 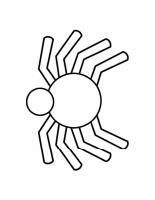 (Open writing activities-S like spider) Print for each child or laminate for use with a dry-erase marker. (Open stationery-Spiders) Print. Use the stationery to communicate with parents, in your writing corner, or to identify your thematic bins. (Open sequential story-Spiders) Print. Laminate the illustrations and cut them out. Children must place the illustrations in the correct order. Green Easter straw in a shallow container with plastic insects children can play with. Offer only green, black, brown, and red blocks and use them to build giant bugs. Assembly games (K-Nex and Magnetix) will make it possible for children to imagine all kinds of insects. Drinking straws can be inserted one inside the other to create a very long worm. You may even organize contests to see who can make the longest one. Plastic insects and poster paint. Children will enjoy pressing the insects in the paint and then on a sheet of paper to make prints. Attach plastic or jelly worms to the end of a fishing rod. Dip them in paint and then on paper to make prints. Make unique insect crowns. Simply glue antennae on a strip of paper. Use red and black paper to make ladybug crowns and black and yellow paper to make bumblebee crowns. An empty toilet paper roll, cardboard wings, pipe cleaners (antennae), and a little paint are all you need to create cute butterflies or bees. Attach a clothespin to the centre of coffee filters to make butterflies or dragonflies. Add a few drops of food coloring for a magical effect. Provide a butterfly outline and tissue paper children can tear and glue on the wings to create a multicoloured butterfly. Trace a butterfly or ladybug outline on a transparency sheet. Apply glue liberally and sprinkle with colourful sand to create a fun stained glass effect. Use two paper plates (one of which is cut in two), a fastener, and red and black paint to create a ladybug. Two egg carton sections, wiggly eyes, yellow and black poster paint, cardboard or tulle wings, and antennae are all you need to make a bumblebee! Make a beehive by gluing Honeycomb cereal on a box. Pieces of pink, brown, and black yarn to represent worms. Use glow-in-the-dark paint to create a firefly. Glue two empty toilet paper rolls together and add a string and cellophane paper to make binoculars. Use pieces of string dipped in paint to paint worms or make worm-like impressions. Use a row of egg carton sections to make a caterpillar. Pour a small amount of brown or black paint on a sheet of paper and have children blow through a drinking straw to paint a spider. Flower, insect, or garden stencils. Set up a beekeeper area complete with beekeeping veils and helmets, a rain suit, a few plastic bees, a large square box (beehive), and a few tools such as a shovel, a watering can, etc. Create an insect hunter area that includes butterfly nets, containers for collecting insects, plastic insects, binoculars, index cards, pictures of different types of insects, magnifying glasses, etc. Offer a gardening corner. Simply provide a variety of accessories such as toy versions of watering cans, flower pots, etc. Add gardening gloves, a sun hat, a hose, and knee protectors. Fill a bin with insect costumes. Children will love to dress up like bugs! Homemade or store-bought puzzles related to the theme. Modeling dough with different types of insects that can be pricked in the dough. You can also offer insect-shaped cookie cutters. Salt dough that can be used to create insects. Real insects captured in small plastic containers. Association game involving insects (insects that bite, insects that crawl, insects that fly, etc.). Insect illustrations. Children can count how many dots are on each ladybug for example. Association game with bees that must be associated to flowers of the corresponding color. Pictures of butterflies that can be used to decorate the walls of your area. Insect outlines children can trace. Games in which children must find the differences between two insect illustrations. Pretend you are worms and slither across the floor. Create an obstacle course that includes chairs children must crawl under as if they were ants. Simon says... to act like different types of insects. Set a jump rope on the floor and encourage children to walk on it, pretending it's a worm. Move a jump rope back and forth on the floor and invite children to jump over it. Pretend to fly around the room like an insect. Pin the tail on an insect. Have children crouch down, one behind the other. Have each child place his/her feet on the shoulders of the child who's next in line to represent a caterpillar. Have children sit in a circle and toss a ball of yarn back and forth to create a giant web. Fill a large container with dirt and add a few worms. Hide plastic worms in your sandbox. Fill a container with Honeycomb cereal and let children play in it. Add a few Styrofoam lily pads to your water table along with plastic insects that can be seen on water such as a praying mantis or dragonflies. Create a vivarium. Use an old aquarium or a clear container. Add dirt, a few blades of grass, and any insects children find outside. Don't forget to set a screen on top! (Open game-This is my spot-Spiders) Print two copies of each illustration. Use adhesive paper to stick one copy of each illustration on the table. Place the second copy in a bag. Children take turns picking an illustration to determine where they must sit at the table. You may also use the illustrations to determine children's naptime spots or their place in the task train. (Open my spider path) Print, laminate, and secure the illustrations on the floor of your daycare to create a path leading to the areas frequently visited by children throughout the day. The path can lead to the bathroom, the cloakroom, etc. If you prefer, use the illustrations to delimit various areas. (Open models-Spiders) Print, cut out, and laminate the items. Use different lengths of fishing wire to hang them from a clothing hanger suspended above your changing table. Fill a large container with black toys to give little ones the opportunity to explore this color. Name the color often throughout the week. Fill several empty plastic bottles with black items (feathers, marbles, beads, paperclips, etc.). If you wish, you may even fill a bottle with black water (soak an old black marker tip in water). Seal the caps using hot glue. Collect a variety of clear plastic containers (mayonnaise, peanut butter, juice, salad dressing, etc.). Deposit different items found in nature in each bottle along with a few insects. You can have a ladybug container, a fly container, a spider container, etc. Use hot glue to secure the lids. (Open lacing-Spiders) Print, trace the shapes on heavy cardboard, and cut them out. Punch holes all the way around each model using a hole-punch. Children will enjoy lacing the shapes with a shoelace or a piece of string. Divide your group into teams of two. One child from each team gets down on his/her hands and knees (four spider legs) and his/her partner must climb on top, resting his/her stomach on the other child's back to represent the four missing spider legs. Encourage children to try to move about. Variation: You may organize races or have children complete an obstacle course in this position. Give each child a ball of yarn. Attach one end to an object within the daycare (chair, furniture items, etc.). Just like real spiders, children can weave a giant web by moving their ball of yarn in every direction. Divide your group into teams of two. Give a small stack of playing cards to each pair of children. One child turns one card at a time. The other child must guess, before he/she sees each card, if it is black or red. Children enjoy this simple game which is great for developing fine motor skills and observation skills. Where are the spiders hiding? Hide several plastic spiders throughout the yard. Children hunt for spiders. Each time a child finds one, he/she must run to a basket and deposit it inside. Encourage children to keep hunting until all the spiders have been collected. For this activity, your hands and children's hands become spiders. Have children sit in a line on the floor (one behind the other). Encourage children to move their hands up and down the back of the child sitting in front of them. After a few minutes, everyone changes places. Repeat the activity. This is a great calming activity before naptime. 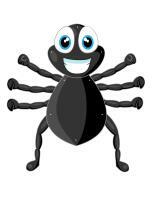 (Open models-colored spiders) Print and laminate the spiders. Set them on the floor of your daycare. To the sound of music, children walk around the daycare. When the music stops, they must quickly step on a spider. Variation: If you wish, you may remove a spider after each round to make the activity more difficult. There can be more than one child on each spider. (Open educ-pairs-Spiders) Print. Children must draw a line between identical illustrations or color them using the same color. For durable, eco-friendly use, laminate for use with dry-erase markers. (Open educ-trace-Spiders) Print for each child. Children must trace the lines using the correct colors. When they reach the end of each line, they may also color the object with the corresponding color. 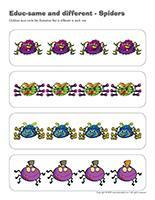 (Open educ-same and different-Spiders) Print and laminate for durable, eco-friendly use. Chidlren must circle the illustration that is different in each row. 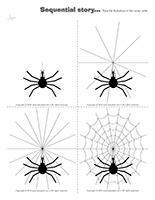 (Open Sudoku-Spiders) Print the Sudoku grid and the illustrations. Cut the cards and laminate them for durable, eco-friendly use. Children must arrange the cards on the grid according to traditional Sudoku rules. There cannot be two identical illustrations on the same vertical or horizontal row. 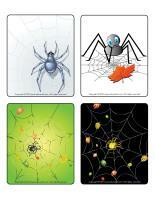 (Open educa-duo-Spiders) Print and laminate for durable, eco-friendly use. Children must draw a line between items that form a duo using a dry-erase marker. (Open hunt and seek-Spiders) Print and laminate. Children pick cards and must find the items in the scene. 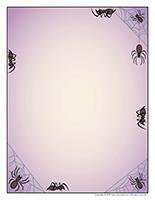 (Open game-Spider web) Print and laminate. 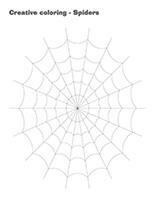 Children stick the spiders on the web, associating them according to their size. Invite a mother (or grandmother) to demonstrate knitting for your group. Help children realize how knitting is very similar to the methods used by spiders to weave their webs. Add nets, small containers, tweezers, magnifying glasses, plastic insects, a microscope, binoculars, a vivarium, a beekeeper hat and veil, and an empty bug repellant bottle to a large container. Let children explore the different items. Fill a sensory bin with white or colourful yarn (several metres). Add plastic spiders in different sizes. Children will enjoy making the spiders crawl on the "webs". Variation: Around Halloween, you can find glow-in-the-dark spiders in big box and dollar stores. Deposit these spiders in your sensory bin and let children play in the dark for a special treat! Go for a walk with your group in a nearby park or wooded area. Give each child a magnifying glass and encourage them to search for spider webs (and spiders!). You will need clear containers, magnifying glasses, tweezers, pieces of tulle or screening, and pictures of spiders in nature. Use these tools to compare the spiders collected by the children in your group during the previous activity. Organize a special workshop in which children attempt to create this color. Encourage them to mix different colors of poster paint or use water and food coloring to test different combinations. Use magnifying glasses, butterfly nets, and tiny containers to search for and capture insects. Explore the bushes, grass, and soil in your yard. Melt chocolate and butterscotch chips in a double boiler. Add marshmallows and Chinese noodles and mix well. Use a spoon to spread the mixture on a cookie sheet layered with waxed paper. Place cookie sheet in refrigerator. Serve once preparation is completely set. Bake cupcakes with your group. Once they have cooled, spread dark chocolate icing on them. Add black licorice ribbons to represent eight legs and candy pieces for the eyes. Serve the cupcakes at snack time. 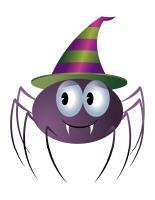 Variation: To make colourful spiders, use red, purple, or green licorice for the legs. For each child, you will need an Oreo cookie, 2 chocolate chips, and 8 pretzel sticks. Have children gently insert the pretzel sticks in their cookie to represent a spider's legs. Using a tube of decorative cake gel, add two drops on top of each cookie and have children press the chocolate chips on top (the eyes). Children will be eager to taste their creation. Some may like to take a spider home at the end of the day. For this reason, make sure you have extra ingredients on hand. (Open stencils-Spiders) Print and cut out the stencils. Children can use them to trace or paint a variety of items related to the theme. (Open models-Spiders) Print as many copies as you need. Use the models throughout the theme for various activities and projects. (Open miniature spider) Print, cut out, and color. Stick the different parts on an empty toilet paper roll to create a miniature spider. Hang the spiders from the ceiling. (Open puppets-Spiders) Print the models on heavy cardboard. Have children cut them out and decorate them as they wish using different Halloween-coloured items. Glue a Popsicle stick behind each model to create puppets. Have children paint a Styrofoam ball using black poster paint and insert eight pipe cleaners to represent legs. Add wiggly eyes. (Open models-Spiders) Trace a spider model on black paper. Have children cut it out. Let them decorate the spider. When they are done help them curl their spider's legs by wrapping them around a pencil. Create spider webs by cutting slits in a folded paper circle, just as you would do to create paper snowflakes. Tie four pipe cleaners together to create eight spider legs. Attach a long piece of elastic thread in the centre. Hang the spiders from the ceiling. Children will also enjoy bouncing the spiders up and down. You will need paper plates, black poster paint, wiggly eyes, and pipe cleaners. Have children paint a paper plate with the black paint. Let them add eyes, a nose, a mouth, and legs to complete their spider. (Open models-Spiders) Print for each child. Encourage children to apply white glue all over their model and press dried black beans on top. You can use two dried (red) kidney beans for the eyes to create a scary spider! (Open creative coloring-Spiders) Print for each child. Invite children to complete the drawing. (Open I am learning to draw-A spider) Print and laminate the model. Invite children to practice their drawing technique on the model sheet. When they are ready, they can try to draw a spider on their own. (Open complete the drawing-Spiders) Print for each child. Children must complete the drawing as they see fit. 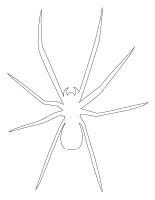 (Open coloring pages theme-Spiders) Print for each child.